OETA will continue to broadcast PBS KIDS shows 24 hours a day on a designated channel and offer a live stream, making it easy for Oklahoma children to watch their favorite series during primetime and other after-school hours when viewing among families is high. Viewers will be able to watch the OETA-branded live stream through pbskids.org and on the PBS KIDS Video App, which is available on a variety of mobile devices, and tablets. Soon after launch, the live stream will be available on over-the-top platforms such as Roku, Apple TV, Amazon Fire TV, Android TV, Xbox One and Chromecast. The live stream complements on-demand clips and full episodes, which will continue to be available for free on the PBS KIDS Video App and streaming via pbskids.org. Following its initial launch, the localized live stream experience will expand to offer an integrated games feature, enabling children to toggle between a PBS KIDS show and an activity that extends learning – all in one seamless digital experience. The live stream and games feature is grounded in research demonstrating that measurable gains in learning are achieved when children engage with PBS KIDS content on multiple platforms. The games will align with the learning goals of each TV series, deepening children’s involvement and supporting learning. PBS stations reach more kids aged 2-5, more moms with children under 6 years old and more children from low-income families than any other kids TV network. With its new 24/7 channel and digital offerings, OETA will build on this reach and impact. Through this effort, OETA will extend its commitment to early learning by offering more families high-quality PBS KIDS content that is trusted by parents and proven to help kids learn. In a recent survey, PBS KIDS led all networks in improving kids’ behavior, with 74% of parents saying their child exhibits more positive behavior after engaging with PBS KIDS. And years of research confirm that PBS KIDS media content helps children build critical skills that enable them to find success in school and life, while also helping parents increase their own engagement. A recent study conducted by WestEd found that PBS KIDS resources can help narrow the math achievement gap for children from low-income families and better prepare them for kindergarten. Additionally, parents’ awareness of their children’s math learning increased significantly – as did their use of strategies to support their children’s learning. Designed to meet the needs of today’s kids, OETA’s PBS KIDS channel services will provide learning opportunities for children whenever and wherever they access media. Nielsen data demonstrate that live TV is the dominant way children access video, accounting for 67% of the time children spend watching video content. Most kids’ TV viewing takes place on weeknights and weekend afternoons and evenings. This trend is true for all children, but especially for those in low-income families. OETA’s PBS KIDS channel will include popular favorites, such as Daniel Tiger’s Neighborhood, Odd Squad, Wild Kratts, Dinosaur Train, Nature Cat and Ready Jet Go! ; and Splash and Bubbles, a new series that premiered in November 2016. The programming changes include consistency in the schedule with the same rotation seven days a week. OETA will continue to carry children’s programming weekdays on its OETA-HD (click here for a downloadable schedule), high definition channel available statewide. 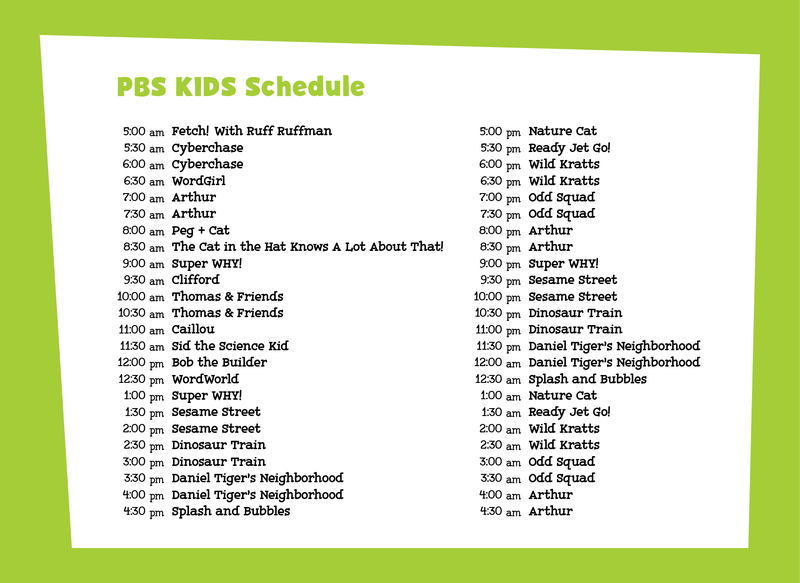 The schedule of children’s programming on OETA-HD will be different from OETA’s PBS KIDS channel, offering families a variety of options. OETA also recently announced the inclusion of children’s programing Saturday and Sunday mornings on its OETA OKLA channel. OETA’s PBS KIDS channel is an integral part of the organization’s long-term vision for its children’s service and builds on the reach and impact OETA’s programming and educational initiatives already have in Oklahoma communities, where OETA provides essential services for children, parents and teachers. Click here for information on how to access OETA over-the-air, through cable and satellite providers, through streaming services and online.